Queen Street, Middleton Cheney, OX17 2NP. We are a faithful membership supporting worship on Sundays, maintaining the legacy of over 160 years of Methodism in the village. Worship is conducted by a mixture of lay preachers and Ministers over the year, mostly on Sundays at 10.45 a.m. Please check the poster displayed in the notice board for details. We are a warm and welcoming church, with disabled access, efficient gas-fired heating system, toilets, and a sound amplification system with hearing aid loop facility. The main church which seats approximately 100 people,still retains mostly the original features, including pews, but there are some comfortable upholstered chairs too. We hope to do more work on this aspect and other improvements at some point .As we have no organist at present, we have an excellent 'Hymnal Plus' which is very versatile and well suited for hymn singing. Our schoolroom and kitchen is let to Middleton Cheney Pre-School during term time, but the premises can be hired out of term, and weekends by contacting Mrs.Barbara Webb on 710390. We actively support the Covenant with All Saints Parish Church, and regularly meet to plan joint worship and outreach activities. Our Harvest Festival services on Sunday 6th.October will be joint, and produce will be sold off for charity. We also collect dried and tinned goods for donation to the Banbury Young Homelessness Project. Rev.Janet Jackson has recently moved on to another Circuit,as is Methodist tradition, and our Minister for the next 12 months will be Rev. Rob Anning. We look forward to welcoming you to our fellowship. As early as 1802 a cottage, either owned or occupied By Thomas Chambers was used as a Meeting House, this was usual in the early days of the Methodist movement in this area and continued in the smaller villages until the turn of the century. In 1814 a dedicated building for the congregation was registered, this could have been the Primitive Methodist Chapel in Royal Oak Lane (now an attractive house). Originally mentioned in a Will dated 1762, the premises which included a cottage, or cottages with garden and a barn or weavers shop were eventually acquired by the trustees of the Chapel in 1849 for the sum of £70. Although the attendance of the Church was fairly good up until the 1850s the membership began to decrease and eventually the property was sold in two lots in 1896. 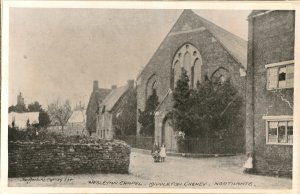 In 1866 a meeting was held in Banbury where it was agreed that a new Chapel should be built in Middleton Cheney instead of repairing the old one. The building, situated in Queen Street was to seat 300 people at a cost of £500. Mr Jones, a prominent Middleton farmer agreed to guarantee four-fifths of the debt and the Wesleyan Quarterly Magazine recorded the laying of the Memorial Stone on Friday 16th August 1867. The premises were later enlarged when the Sunday School was added in 1907 on the site of two cottages and outbuildings. 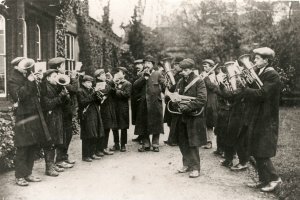 After the turn of the century the Methodist congregation started their brass band, known as the Wesleyan Temperance Band. It was customary for this band to assemble outside the chapel and march down to the village green. To the great delight of the school children the band was led by a person carrying an oil lamp on a long pole during the winter months. After their march the band returned to the Chapel to take part in the Sunday evening service. This Band did not continue after 1914.